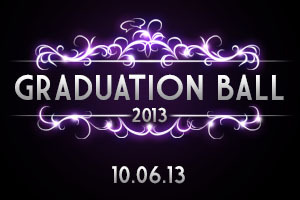 We’re very excited to reveal the first details of your Graduation Ball 2013 – the ultimate end to your university career and the biggest night of the year! This year it’s being held on Monday 10th June and after the incredible success of last year, where we delivered one of the best Graduation Balls we’ve ever seen, Oceana in Southampton will once again be providing the venue. Don’t forget to save the date! Tickets will be on sale to graduates next week, on Wednesday 20th February at 8am and will be available from www.susu.org/boxoffice or in person from The Box Office at Reception (Building 42). Tickets will go on sale exclusively to graduates, but will be released for general sale at a later date so that your friends in other years are able to attend (this will be dependent on ticket sales). Over the next few weeks we’re going to be bringing you more exciting news on how we’re going to make this year’s Ball the best yet – so look out for more announcements coming soon!